What exactly is “meal prepping?” Before jumping into that, we were just wondering how much time do you spend in the kitchen every week? Does dinner stress you out every evening? Do you spend most of the evening cleaning up the dinner marathon? Yes, we know exactly how you feel and we have been there. What if you had dinner ready to be cooked every night and could spend much less time in your kitchen? If dinner has you stressed, you should give meal prepping a try! With 5 Dinners 1 Hour meal prepping, you can get a healthy meal on the table in no time. So what are some of the benefits that we have discovered through weekly meal prepping? How many of you have gone through to store trying to plan your meals as you walk the aisles? You have good intentions for the zucchini you bought that was on sale, but a few weeks later you reach in your produce drawer to discover that your beautiful zucchini is now shriveled and mushy. You end up buying things that never get consumed and it eventually ends up in the trash can. With 5 Dinners in 1 Hour, you get an organized grocery list based on the meals you choose, so you will not be walking aimlessly through the store. When you have a concrete plan, with a detailed list in hand, your groceries have a purpose and that means no wasted food (which is always nice for your budget)! As part of 5 Dinners 1 Hour, you will receive a detailed grocery list divided up by sections of the store. Whether you use the custom feature, where you create your own menu from our database of recipes, or you use the “made for you” option, where the menu is already planned for you, going to the store with this organized list will make grocery shopping a breeze! To save even further, you can plan your meals around leftover ingredients you had from the week before. With the custom feature included with the 5 Dinners 1 Hour plan, you can customize your menu based on ingredients you have on hand. “Mom, what are we having for dinner? I’m hungry!” “What do you want for dinner? I don’t know, what do you want”. . . We have all been there before. The dreaded “what’s for dinner” question. Maybe you had something planned to make, but you forgot to take the meat out the freezer in time. Now you are left with the choice of cereal or getting take out. Most of us probably end up choosing the take out or going out to eat. The average American family eats out 4 to 5 times per week. That’s a lot of processed, unhealthy meals each week. 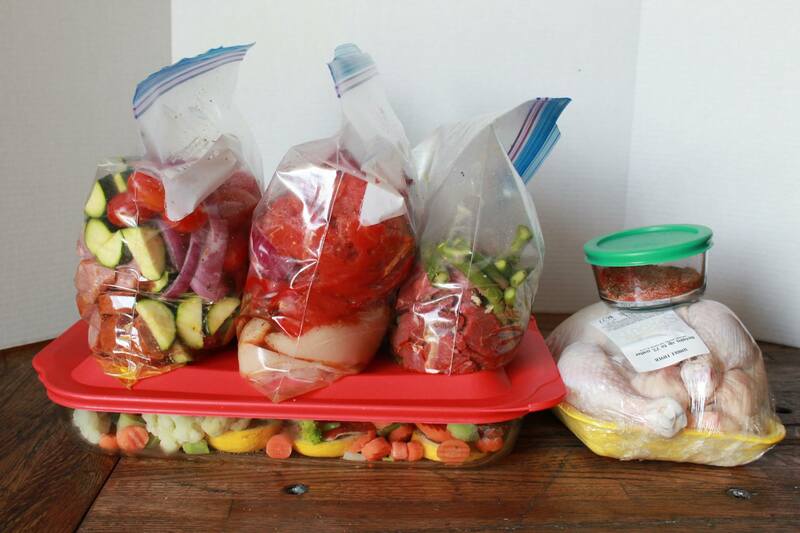 The meals for 5 Dinners 1 Hour can be prepped in ziplock bags or containers. They are meant to be kept fresh in the fridge, although some of them are suitable for freezing, if you choose. I get a great feeling when I look in my fridge and see all of those healthy meals prepped and ready to be cooked! If you have already meal prepped for the week, you won’t dread the “five o’clock shuffle” anymore. Your dinner will not only be planned, but it will also be prepped, waiting for you in the fridge. All you have to do is pull it out of the fridge and put it in the oven. Not only are you going to spend less money by not eating out so much every week, but you will be feeding your family healthy, quality meals. 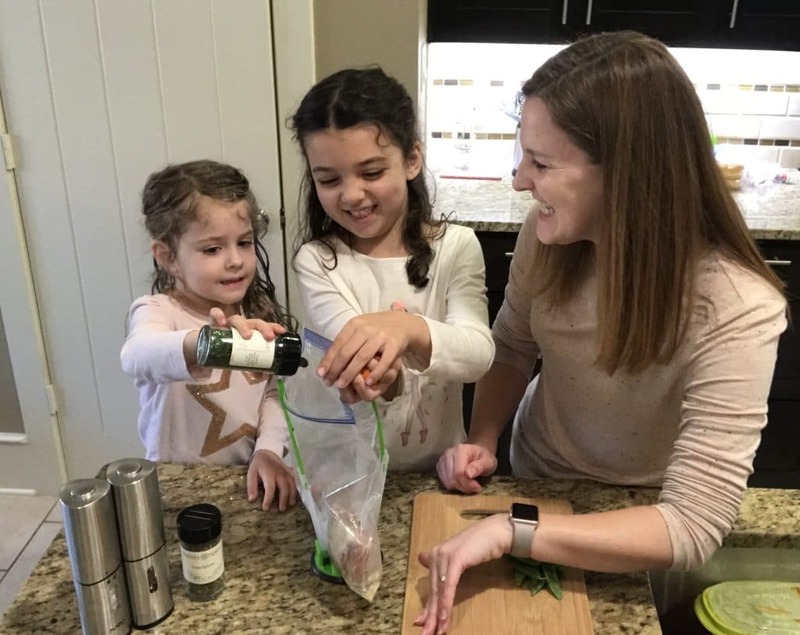 Meal prepping is a great chance to get your kids involved in the kitchen! Let your kids help put ingredients in the bag and give them the fun task of squishing everything around to incorporate all those flavors. Not only will your kids love being apart of this process, they will be more likely to eat the food because they will take ownership in it! Also, if you have to be gone one evening, that is a great opportunity for your older kids, or spouse, to take part in the getting dinner on the table. You can have the printed recipe out on the counter, or better yet, write the cooking instructions directly on the bag. Your family will still be eating real food, even if you are gone for an evening! Not only will you save yourself the stress of thinking about what is for dinner, but you will save yourself even more time not having to spend an hour cleaning up after dinner. I don’t know about you, but anything I can do to help me keep my kitchen clean is a winner in my book! With the 5 Dinners 1 Hour system, you pick one day a week to prep your meals, which means you really only get your kitchen dirty one time during the week (and even clean up after prep is usually pretty quick). Once your meal is already prepped, you will dirty a lot less dishes getting dinner on the table, so clean up will be very minimal. Less time cleaning up your kitchen every night means more time you get to spend with your family! Of all the benefits of meal prepping, having that extra time is my favorite perk. So, go for a walk, play a game with your kids, or just spend some extra time with someone special; whatever you decide to do with that extra time, you will love the freedom that comes from meal prepping! 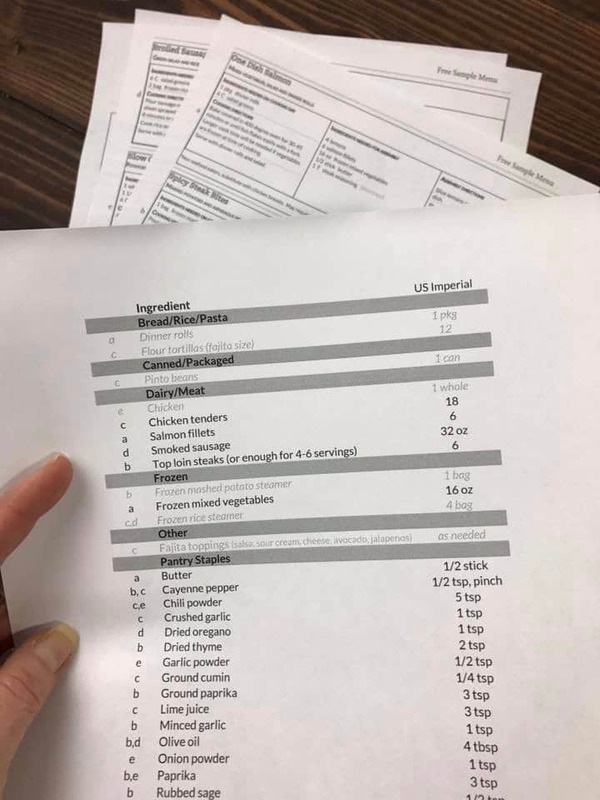 If you are ready to save time, spend less money, and add variety to your meals, click on this link to see the plans 5 Dinners 1 Hour has to offer!